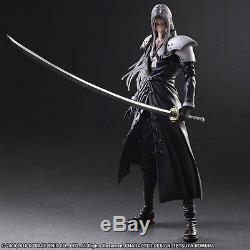 Play Arts Kai Final Fantasy VII: Advent Children - Sephiroth Figure Preorder. This is a pre-order listing for. Series: Final Fantasy VII: Advent Children. Product Line: Play Arts Kai. Specifications: Painted, articulated, non-scale PVC figure with accessory parts and stand. 4 replacement hands (left, right). Villainy has never looked so good! Yes the extraterrestrially enhanced bad guy from Final Fantasy VII: Advent Children has charged onto the Play Arts Kai battleground with his powerful yet elegant figure perfectly recreated. The non-scale, articulated Sephiroth figure stands 11.2 tall and uses clear parts to fully bring out the awesomeness of his hair as well as fine detail in his eyes to make them glow with Mako energy. 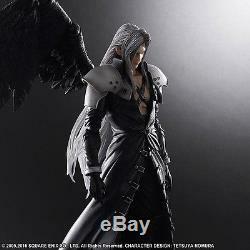 Sephiroth also comes with his wing, sword and four interchangeable hands. Make sure you display him alongside his rival, Cloud, to recreate all that amazing chemistry from the game! If you have any questions about us or this product, please feel free to send us a message and our English representatives will respond as quickly as possible. 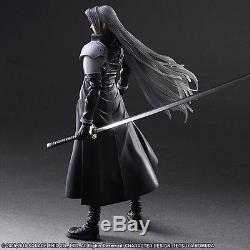 The item "Play Arts Kai Final Fantasy VII Advent Children Sephiroth Figure Preorder" is in sale since Wednesday, August 17, 2016. This item is in the category "Collectibles\Animation Art & Characters\Japanese, Anime\Final Fantasy\Figures, Plush". The seller is "amiibowarehouse2" and is located in Chula Vista, California. This item can be shipped to United States, to Canada, to United Kingdom, DK, RO, SK, BG, CZ, FI, HU, LV, LT, MT, EE, to Australia, GR, PT, CY, SI, to Japan, to China, SE, KR, ID, to Taiwan, ZA, TH, to Belgium, to France, to Hong Kong, to Ireland, to Netherlands, PL, to Spain, to Italy, to Germany, to Austria, RU, IL, to Mexico, to New Zealand, PH, SG, to Switzerland, NO, SA, UA, AE, QA, KW, BH, HR, MY, BR, CL, CO, CR, DO, PA, TT, GT, SV, HN, JM, AG, AW, BZ, DM, GD, KN, LC, MS, TC, BB, BD, BM, BN, BO, EC, EG, GF, GG, GI, GP, IS, JE, JO, KH, KY, LI, LK, LU, MC, MO, MQ, MV, NI, OM, PE, PK, PY, RE.